Ramphastos tucanus Linnaeus, 1758. The genus Ramphastos is made up of 11 species, the largest members of the toucan family. The clade is most closely allied to the mountain toucans (Andigena). English: Red-billed toucan, Cuvier's toucan; French: Toucan de Cuvier; German: Weissbrusttukan; Spanish: Tucan Goli-blanco. cuvieri) with a narrow yellow stripe along keel of upper bill; base of bill is yellow on top and blue on bottom. 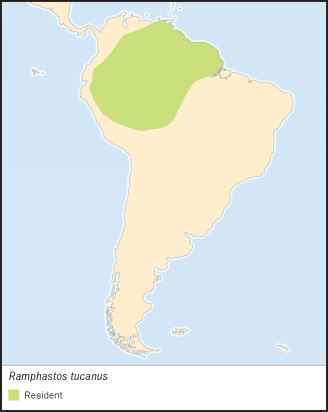 Primarily Amazonian in distribution, ranging from Colombia and eastern Venezuela through Bolivia and Brazil. Often occurs in the same areas as the similar-looking (though smaller) channel-billed toucan. Occupies tropical lowland Amazonian forest almost exclusively, ranging up to 3,600 ft (1,100 m). Also seen in second-growth forest, edge habitat and clearings, and around towns and cities. A conspicuous, large toucan that typically perches on dead branches above the forest canopy. The yelping call—considered the characteristic bird call of the Amazon—is said to resemble a puppy's barking; it begins with a sharp, descending, whining note that is followed by two to four additional monosyllabic pitches. 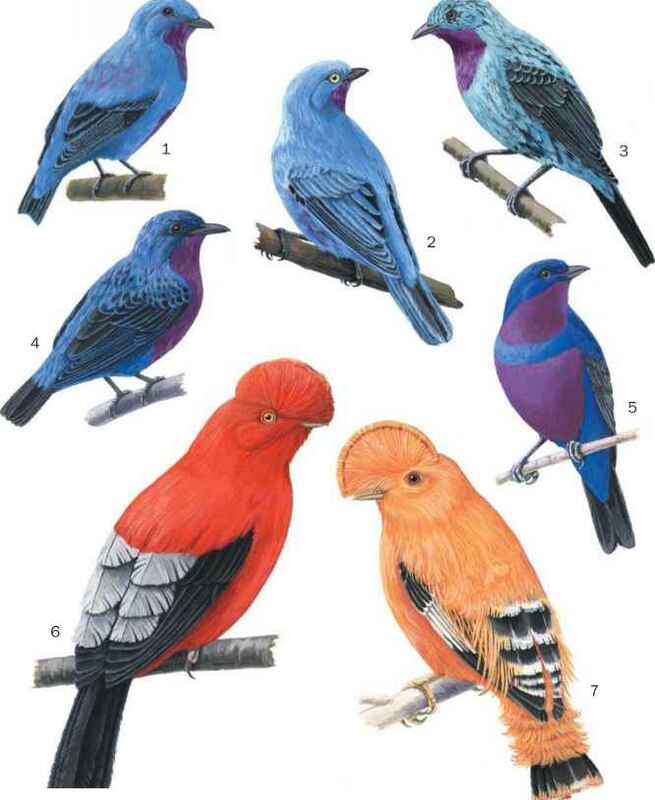 Birds usually travel in pairs or small family groups of up to six birds, although larger flocks are sometimes seen. Aggressive and dominant in interactions with other species at fruit trees. Flockmates seem to engage in play, including bill-fencing, tag, and pass-the-fruit. Not well known but eats a variety of fruits plus insects and lizards and takes eggs and nestlings from a variety of passerines. An active bird when feeding, often plucks fruit with tip of bill, then tosses head so fruit falls backward into mouth. Wipes bill on tree branch afterward, or scrapes bill with foot. To drink, turns bill sideways and swipes across surface of water, then lifts bill up and tilts head back. Courtship behaviors include bill-nibbling, allopreening, and courtship feeding. The breeding season varies with location. Nests are constructed in natural tree cavities, 3-60 ft (1-18 m) off the ground; birds often re-use cavities where they have nested successfully in the past. The two to three white eggs are elliptical in shape; the parents share incubation duties and the eggs hatch after about 15 days. Both parents feed the young, which open their eyes after 29 days and fledge after about 49 days. Capuchin monkeys are a threat to toucan eggs and young.